In Japanese CQ magazine, I informed about my 3 transistor CW transceiver (Jun1992) and 3 transistor SSB transceiver (Nov1992). I wanted to inform about FM transceiver, but it was not informed on that book. I challenged to make very simple transmitter. It is constructed with only one transistor. It makes DSB signal. It can make QSO with normal SSB station. A few years ago I was asked, by Geoff GJ4ICD, to help design and make some beacons for the 6 metre band. These were to be sent to various parts of the world which were not covered by existing beacons. I will show you two types of DSB transmitter. ** Type1 uses active modulator. Type2 uses passive modulator. Each type outputs the same 100mw power. And also each type uses three transistors. I made a simple VHF signal generator in order to measure the characteristic of low pass filter. 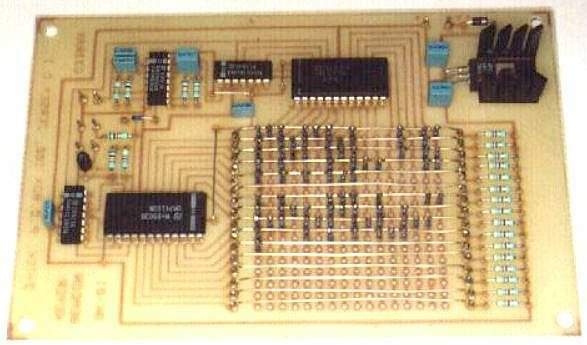 The filter is made to use on 50MHz SSB transceiver.